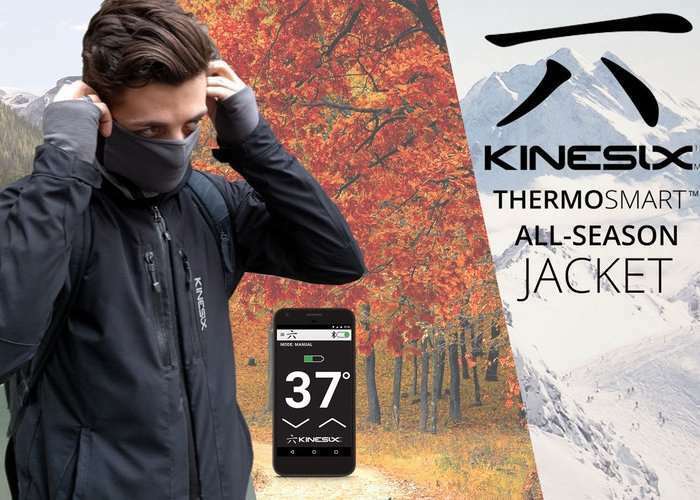 Clothing manufacturer Kinesix Sports based in Montréal, Canada has created a new range of smart clothing which include a smartphone controlled heated jacket called the Kinesix. • Both Men & Women’s version are done. We have right now a men’s jacket in size Medium and a women’s jacket in size Small. • The patterns of each size (XS to 2XL) for each version need to be digitalized for the manufacture to cut the fabric with a laser-cutting machine. • The ClimaFlo fabric is made here in Montréal, Canada and the manufacture is ready to provide us the quantity we need as well as the color we want. This is perfect for us, because we can control the quality of the product. • We used open source electronics to create the software able to manage the heat depending on the desired temperature set by the user. • We already created the mobile app with the automatic mode, meaning every time the app open, there is 2 temperature displayed; the bigger temperature is the average-real time temperature and the smaller temperature is the desired temperature which needs to be set. • We calculated the battery’s capacity according to the 12 heaters based on their maximum consumption. That is why we need a set of 2 batteries to prevent having a huge and uncomfortable battery which would be the opposite of what we are promoting right now. • We already have our list of components and manufacturers ready to create our own electronics board according our specific needs. Kinesix is now available to back via Kickstarter with early bird pledges starting from CA$348 and delivery expected to take place during December 2017. For full specifications and more information jump over to the official Kickstarter campaign page via the link below.